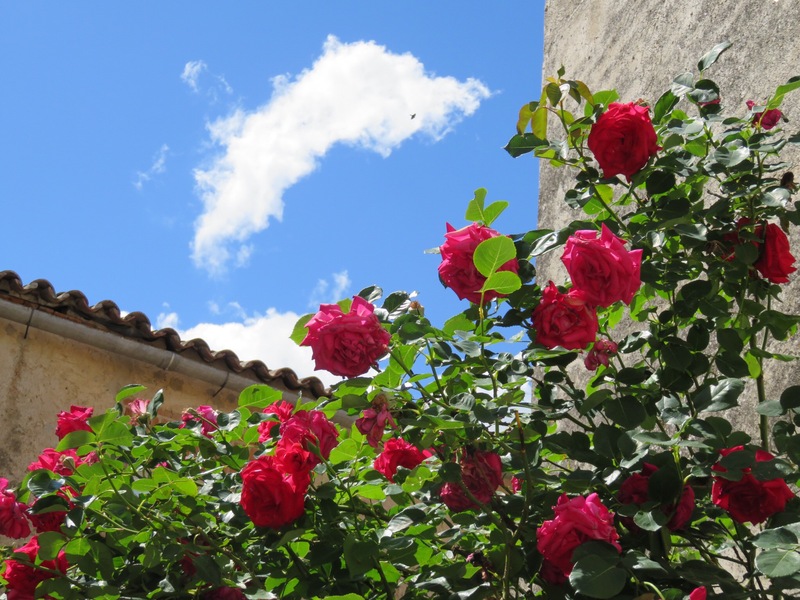 June 16 – Today is a rest day for us, and as luck would have it, rain is forecast for the whole day. When booking this hike, Jim hit a snag, as the next destination after Sedbergh was a place called Burneside, that had no available accommodation whatsoever. The best thing we could do was to book in Kendal, a fair sized city not too far away. This morning at breakfast, we asked our host Carol if she could call us a taxi. After a half hour of trying, she reported back that all three taxis in town were already busy. Perhaps the bus? Great! We love buses. As it is Saturday, the bus runs on a reduced schedule. The next one comes at 10:50. Great! We walked down to the bus stop, in front of the library, and chatted with the librarian and folks coming in for books, including an older couple who told us where all their relatives were buried from the Great War. Eventually, the bus pulled up, and folks queued up in typical British fashion. It wasn’t a full sized bus, but more of a large van, with many of the seats already taken. Two people paid and embarked, at which point the driver announced that the seats were all full, and no one else could get on. Folks got out their mobiles, trying to call a taxi, or canceling their plans. We asked if we couldn’t stand and ride (absolutely not). The driver called and asked if another bus could be sent for the six of us who couldn’t get on, but there was no other bus available. Sigh. Another bus would come in four hours. The old couple from the library watched all this transpire, and when we walked dejectedly back into the library, the husband offered to go get his car and give us a lift. Nice People of England! Philip is a lay preacher at the Methodist Church in town, and we spent the half hour ride talking about his family and his faith, singing in the choir, and the sermon he was writing for Sunday. What a nice man! So here we are in Kendal. A bustling town with folks out shopping on a Saturday in the rain. They have a famous Chocolate House that’s been here since 1657. We didn’t stay out long, but bought some food (meat pies) and went back to our nice hotel for a lazy afternoon of doing laundry and watching the World Cup games. England may be a contender! 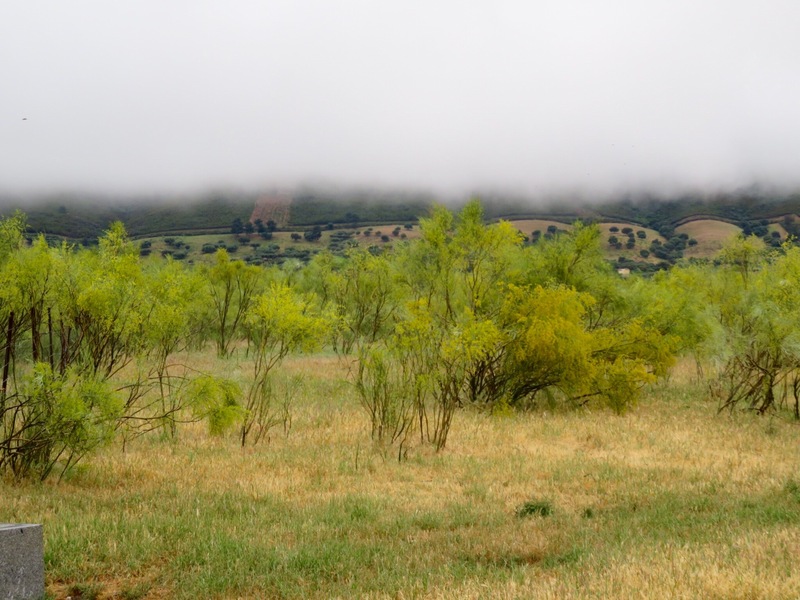 May 5 – Twelve miles planned for today and rain in the forecast. We had our coffee and toast with ham and cheese breakfast at the hostal, and were on the road by 7:15. We climbed a mighty big hill as the sun came up. At the top of the hill was a shady wooded walk. We haven’t had too many of those in Spain. Very nice. Then the rain started, first just a drizzle, then it poured down. The sky cleared by noon, then got breathtakingly beautiful. 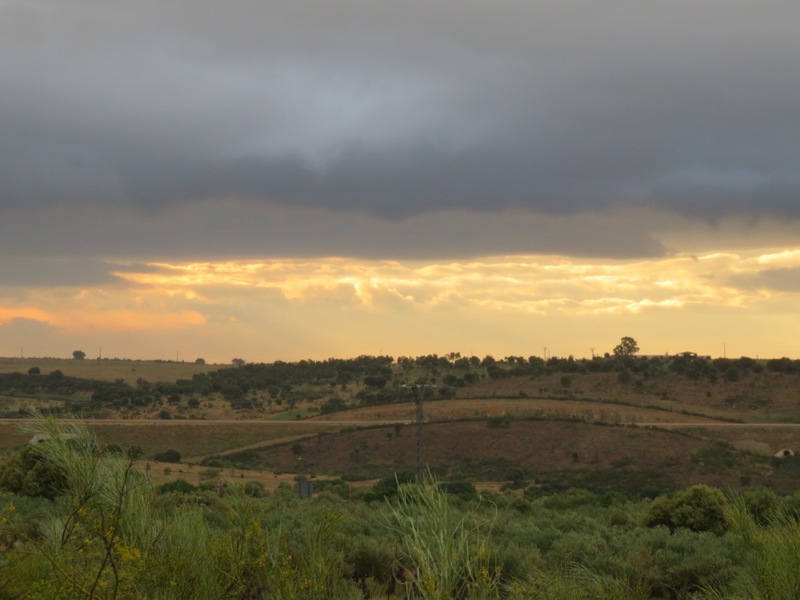 While we were admiring the clouds, we missed the turnoff to Riolobos. We are so used to following yellow arrows that we didn’t realize this road would not be marked. We saw the town get closer, then get farther away! 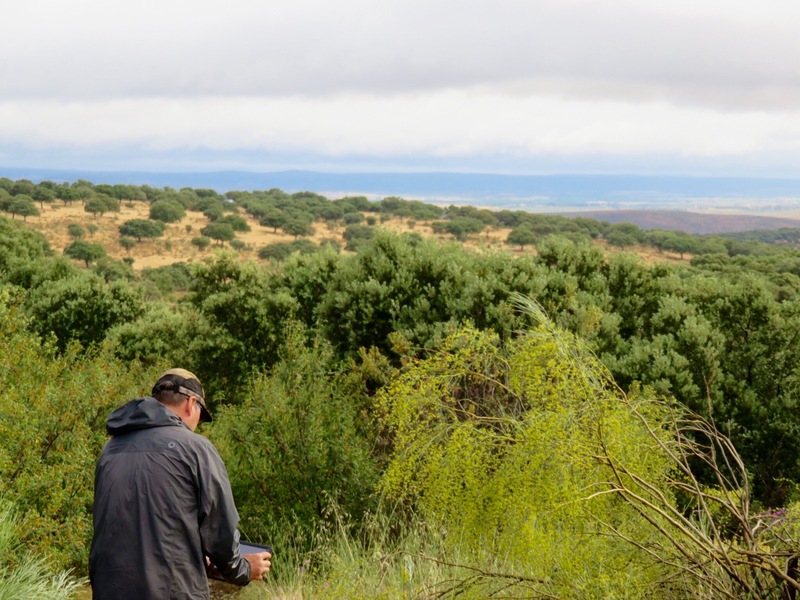 By the time we were sure we had made a mistake, we’d walked an extra two miles, then had to reverse course and retrace our steps to the turnoff. 16 miles walked today. An extra four miles, and I don’t get to subtract them from my total. Drat. And now my feet are sore. 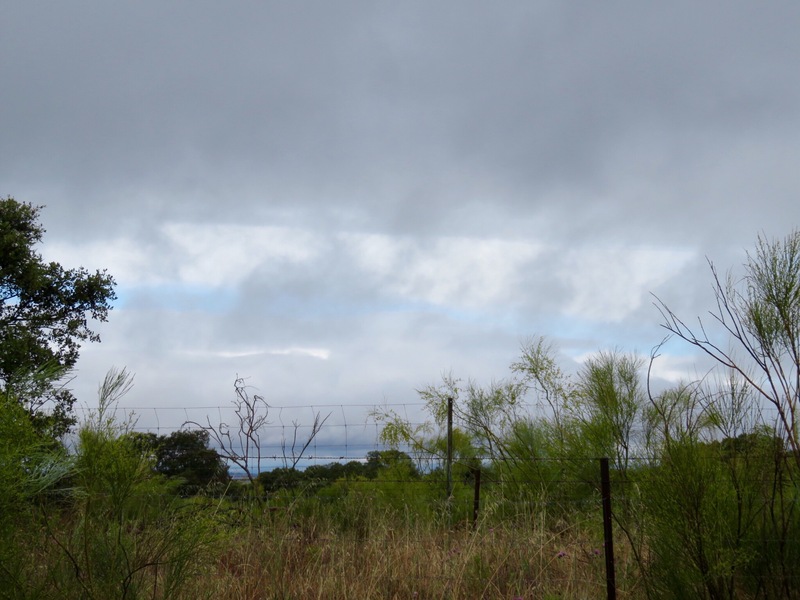 ﻿Apr 29 – Another gray morning, but much warmer than yesterday. Ten miles planned for today. It is drizzling, but no wind. A good day to walk. 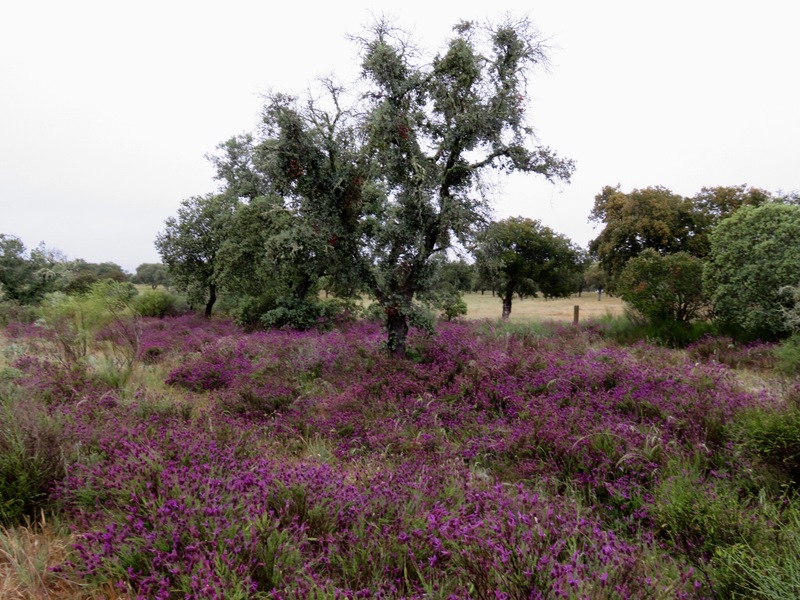 The rain made the purple flowers bloom. 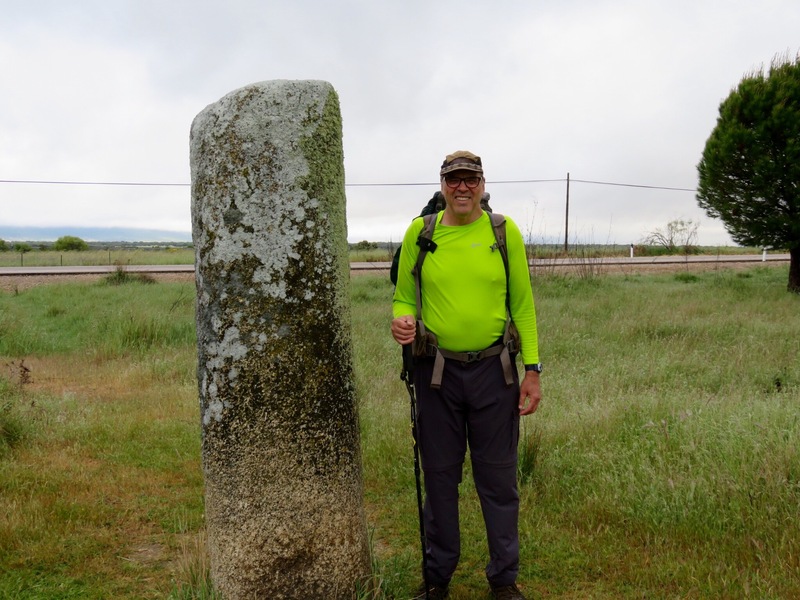 Here’s Jim and an old Roman stanchion. Jim is the one on the right. At mid morning we came upon a little town where we got a cup of coffee. 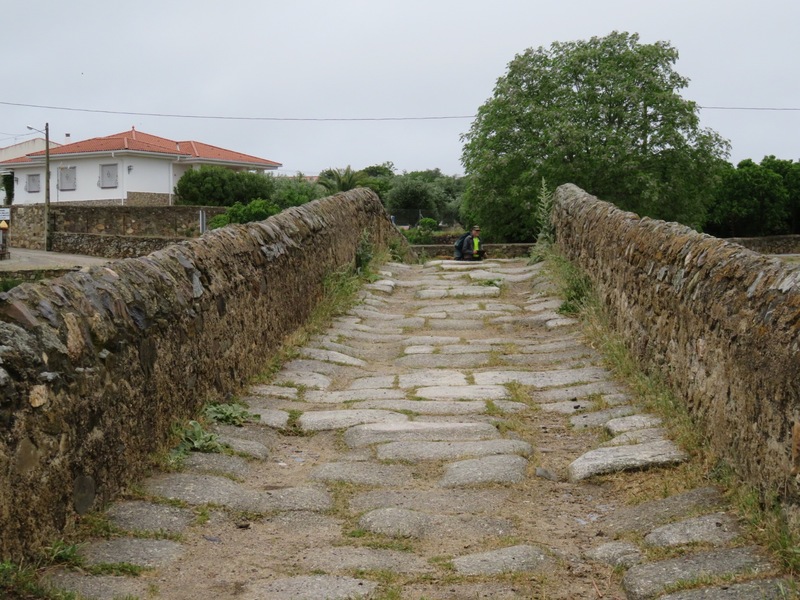 It had an old Roman bridge, still in working order! We were passed by another young German, and spoke with him for a while. 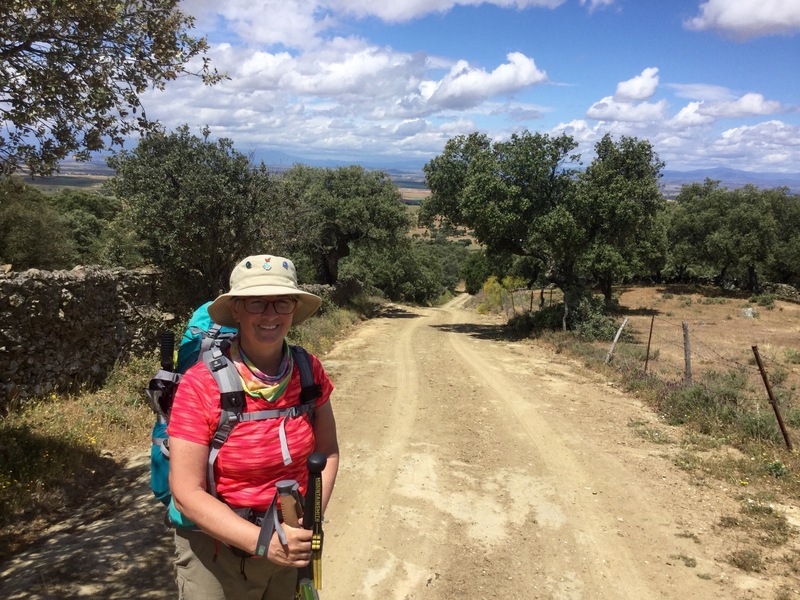 He met his wife walking the Camino Frances – how romantic! Now they take turns hiking while the other stays home with their son. He’s very concerned with the world political situation. So are we. We reached Aldea del Cano by 1pm, purchased our groceries before the shop closed at 2 (remember, no shopping Saturday evening or Sunday!). 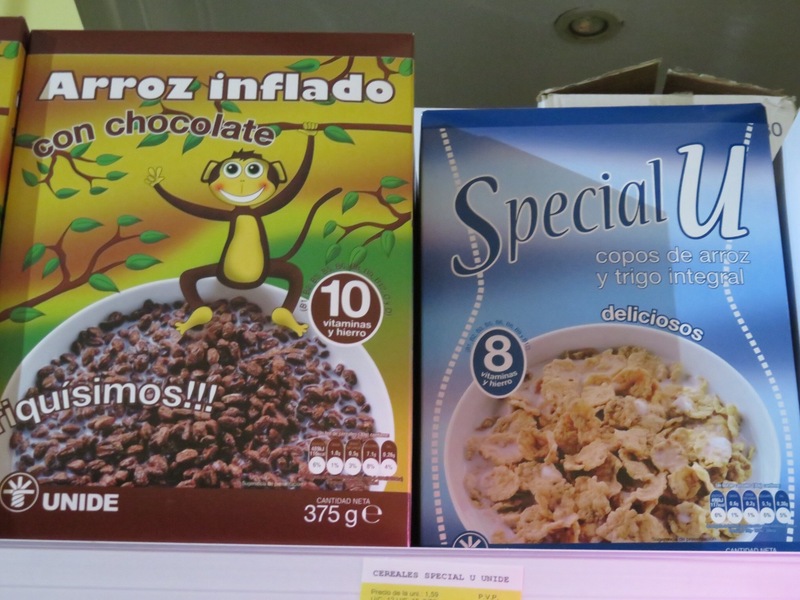 Would you like to have some Special U for breakfast, or some Arroz Inflado? The latter sounds like it might explode in your stomach! 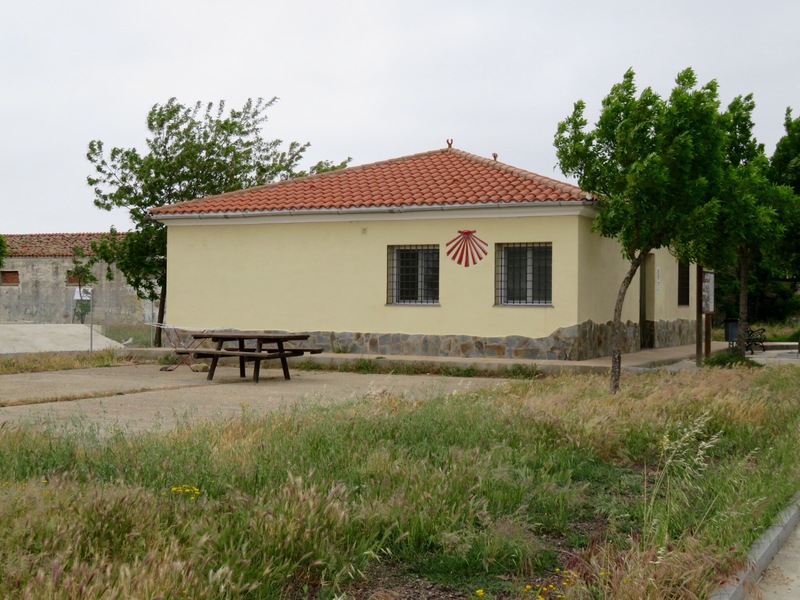 We found our lovely hostal, the Casa Rural. 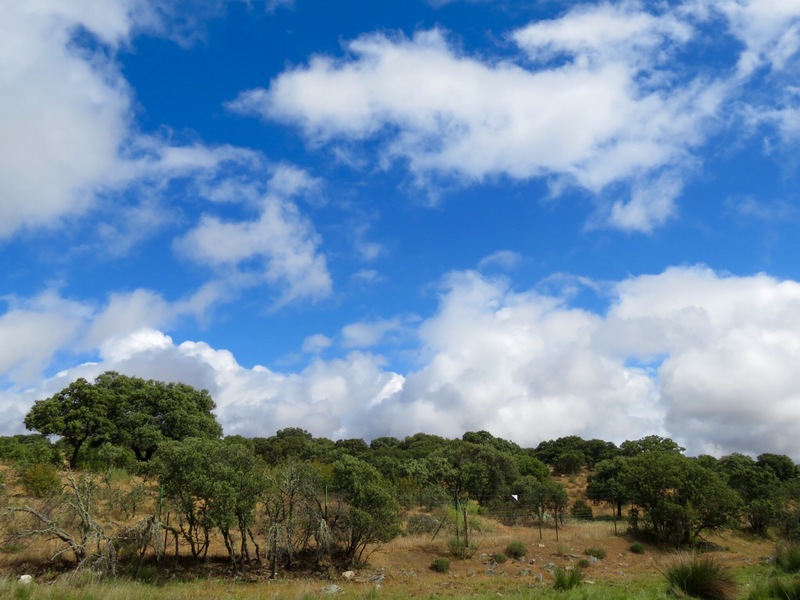 After a shower and a rest, we went out in search of our midday meal and found that the sun had come out like gangbusters. Hope that’s the end of the rain for a while! 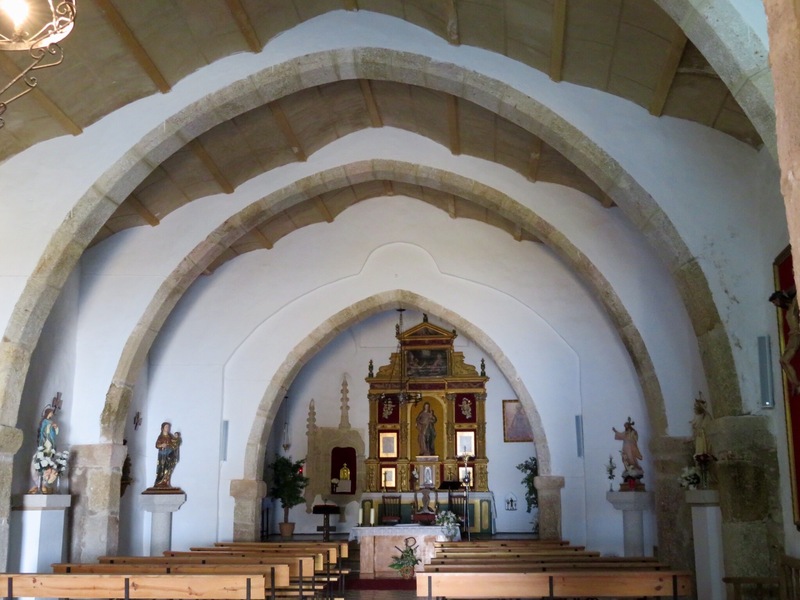 Apr 30 – Yesterday we wrestled with the decision of whether to walk a 14 mile day into the city of Cácares, or break the walk into two 7 mile days by stopping in a teeny village with only one alburgue. 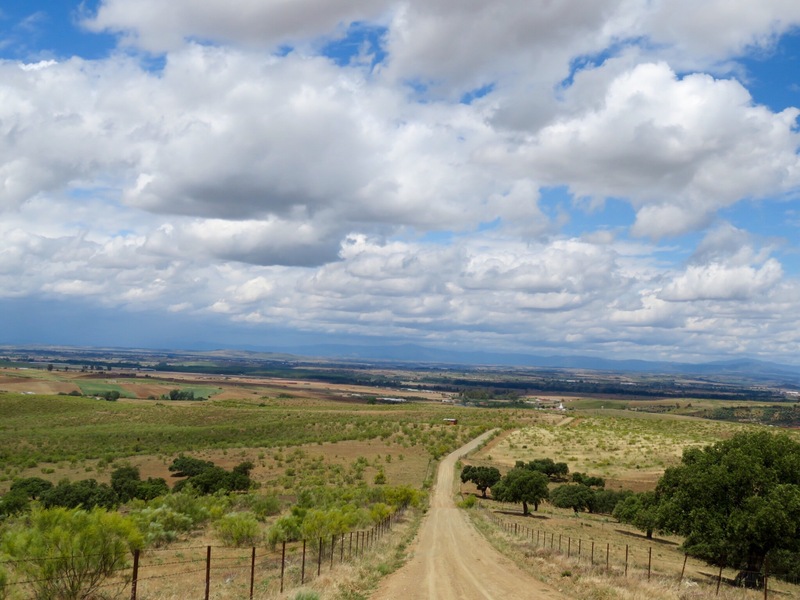 The loveliness of this Casa Rural and the possibility of sleeping late, coupled with the forecast of more rain, helped us decide to break the long walk into two. So seven miles today. 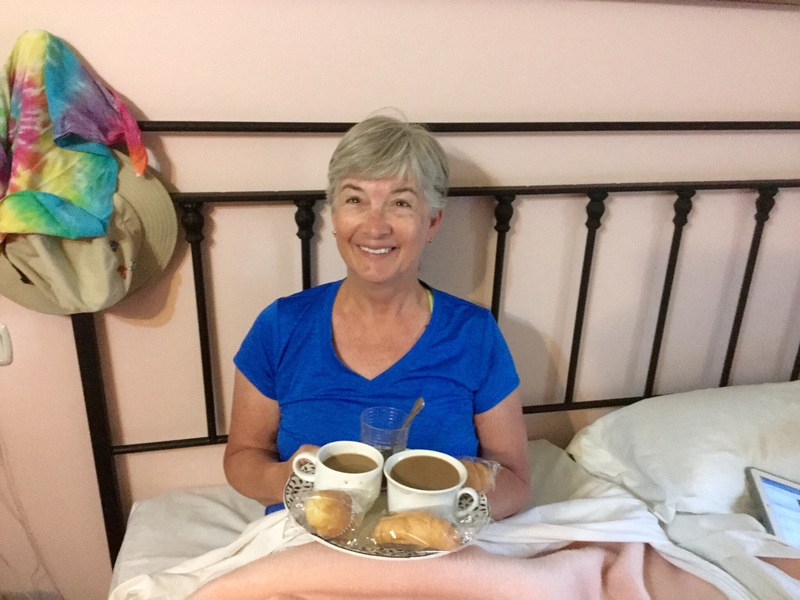 We slept in, and Jim brought me coffee and toast in bed (breakfast in this country is always just toast). Our hostess provided marmalade- a real treat! A wonderful Sunday morning. 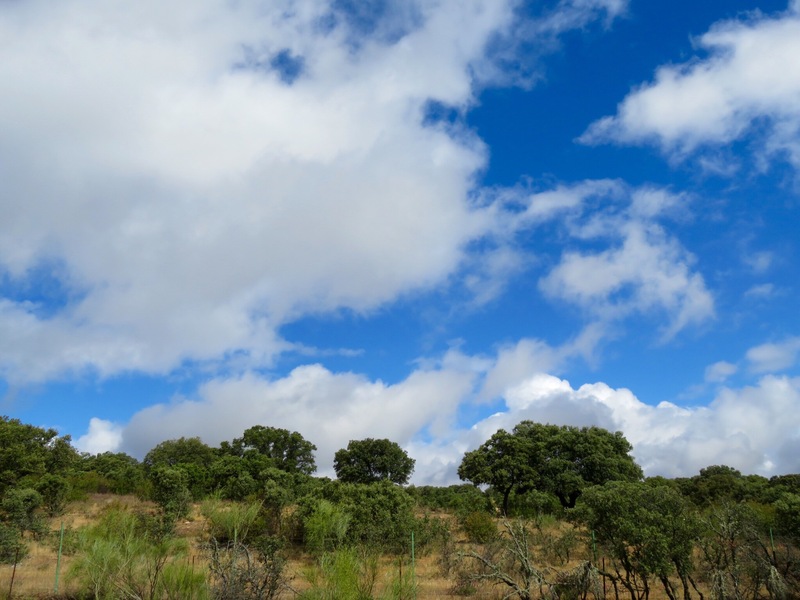 We started walking around 9am – another chilly and windy day, with dark clouds threatening more rain. 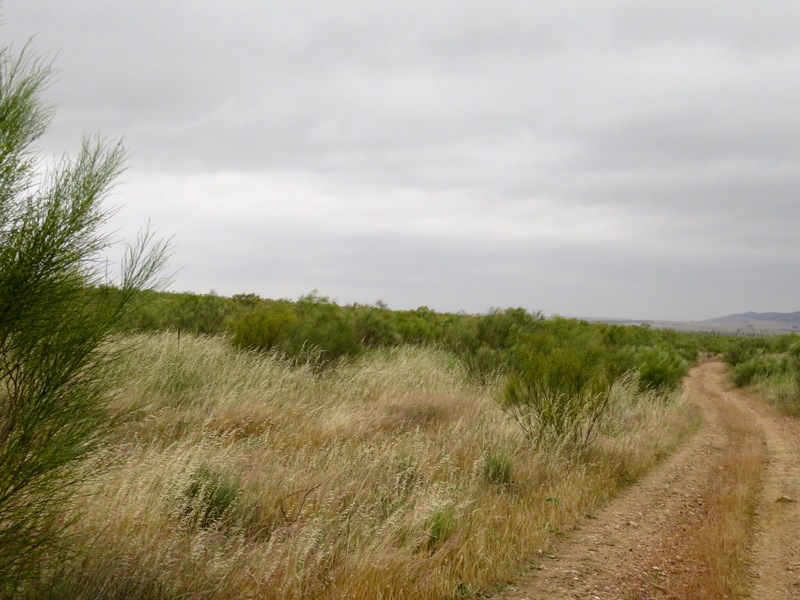 The land was flat and filled with cat tails and scrub pine, reminiscent of the Outer Banks or Fire Island. It rained on and off, and we got to Valdesalor around noon. The alburgue was locked, with a note on the door to pick up the key at the bar down the street. Now the rain was pouring down. We reached the bar, which was locked and dark, with no sign telling us what to do now. Jim asked a woman passing by if she knew where we could pick up the key. She asked us to wait five minutes, then she came back and opened the bar. She signed us into the alburgue and gave us the key. When we got back to the alburgue, the door was open and it was full of dripping wet people arguing in Spanish. We claimed two bunks quickly, and left them to sort out the rest. 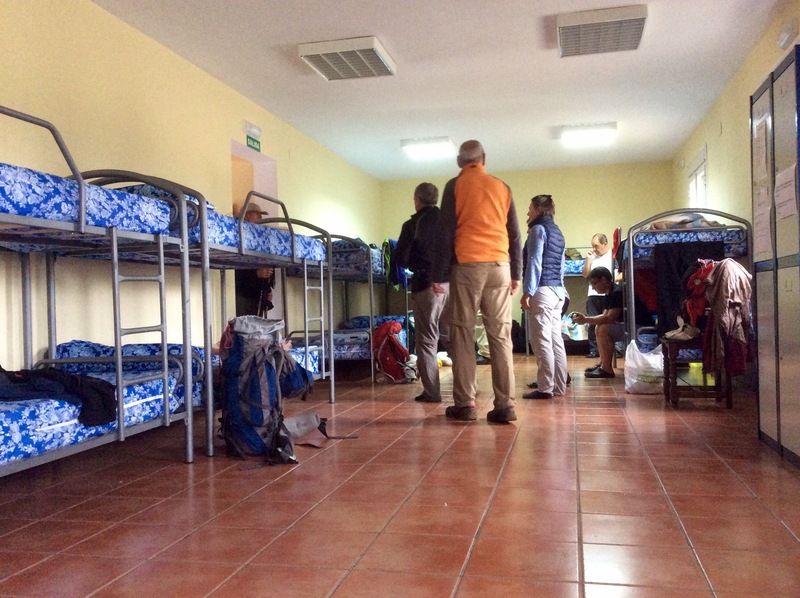 All the 14 beds were filled, and more people kept coming in to get out of the rain. There is only one bathroom, and the door has been locked since we got here. It’s going to be a 😩 😭 miserable night. Apr 27 – Back on the road for an easy 12 mile day of flat terrain. 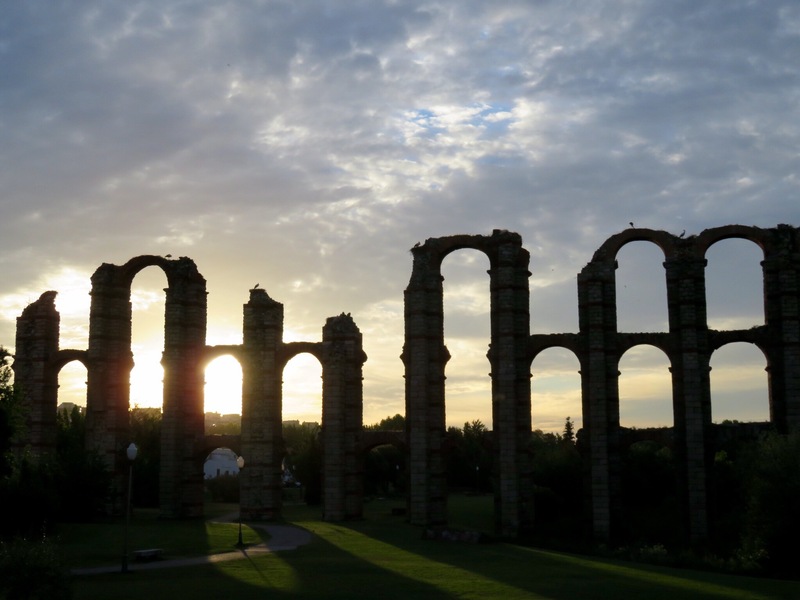 Got to pass by the aqueducts one more time as the sun came up. So long, Mérida! A reminder of how far we have yet to travel. 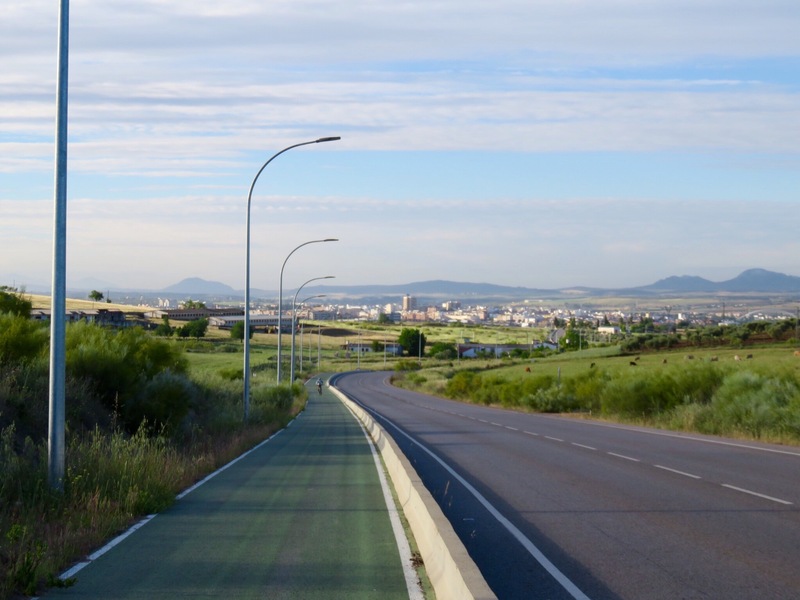 The nice folks of Mérida built a bike path alongside the highway, which gave us a way to walk safely out of the city. 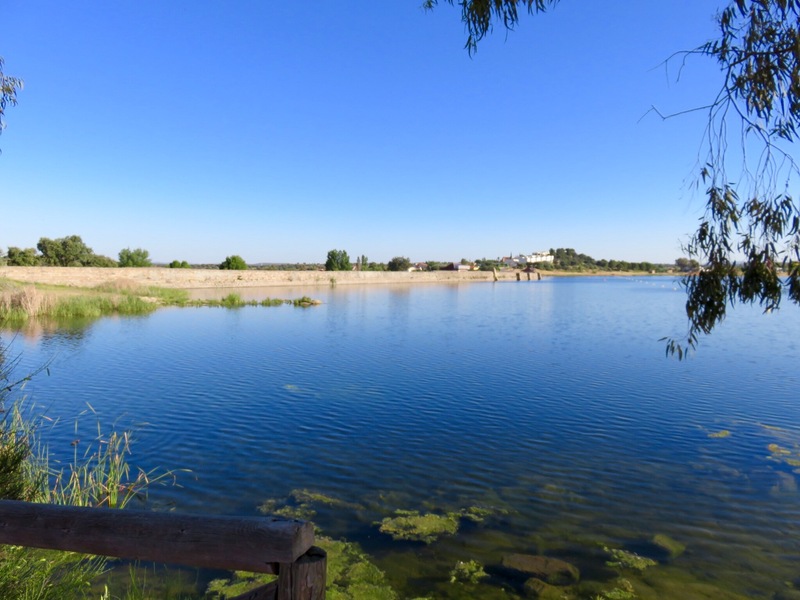 Several miles out, we walked around the Proserpina dam, built by the Romans to provide water for the aqueducts of Mérida. Quiet and so pretty in the morning light. 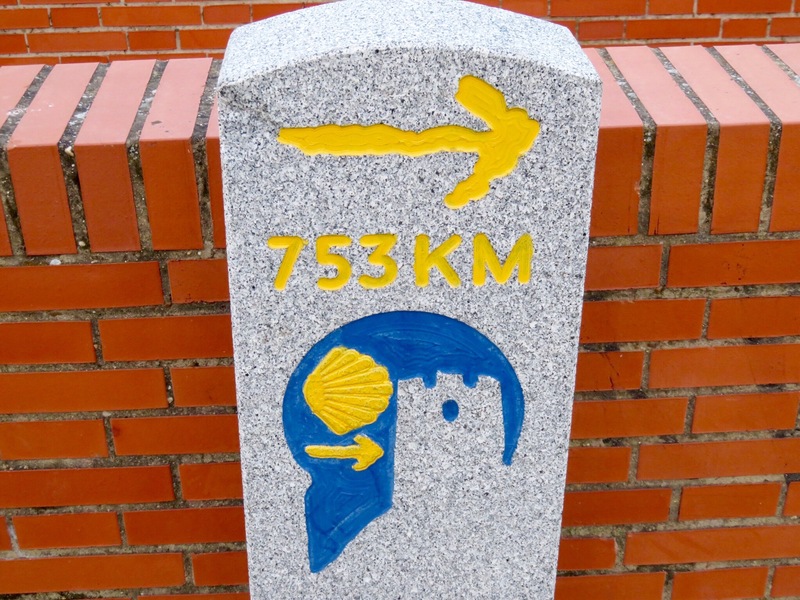 We met a couple from Montreal who are walking their fifth Camino, and were passed by two bikers. We walked through a little town with an open church (a woman was cleaning inside) and we stopped for a quiet moment. 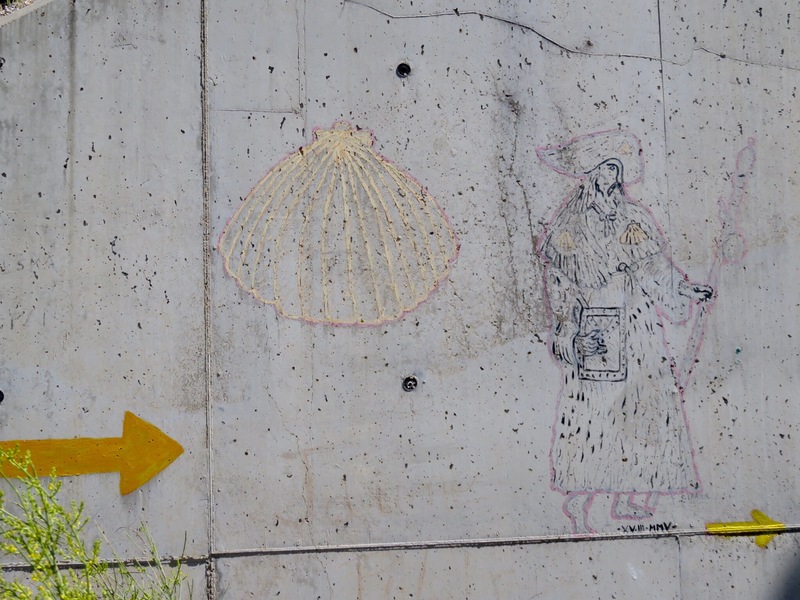 Walking into Aljucén, we saw some Camino-themed graffiti at the highway underpass. 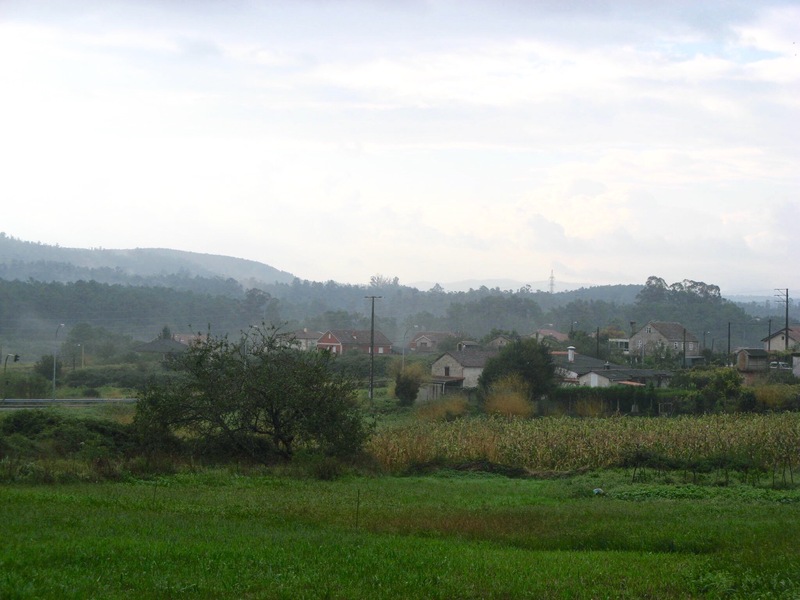 Aljucén is a town of 247 souls, according to Wikipedia, but it has three alburgues and two restaurants that cater to pilgrims. There is no hostal near this town where it is possible to get a room with a private bath, so this will be the first of our Alburgue Days. 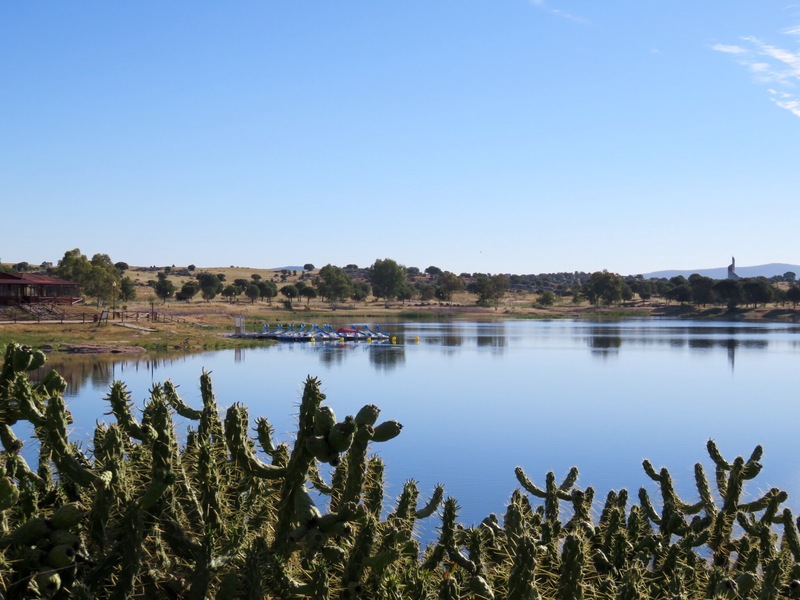 At an alburgue, you get a bunk bed, access to a shared hot shower and a toilet, an outdoor washtub and line for laundry, and access to a shared refrigerator and stove. What you don’t get is sheets, towels, shampoo or, usually, privacy. 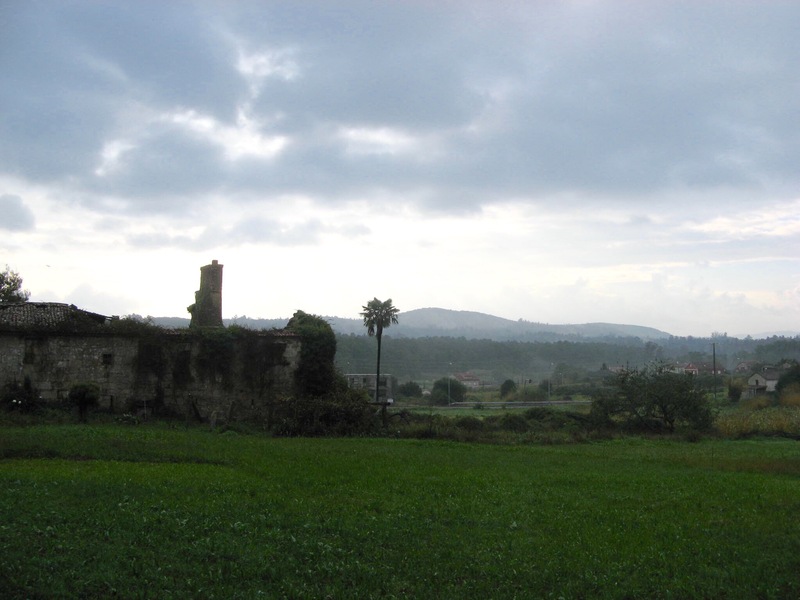 A diehard pilgrim spends every night of his/her Camino in an alburgue, at a nightly rate of $11-13 per person. We have been carrying shampoo, a lightweight travel towel, and silky traveler’s sheets / pillowcase on the chance that we would need them (the traveler’s sheets are really a miracle – they fold into a sack the size of a little packet of tissue, and only weigh a few ounces). We picked the Alburgue Annalena because the pictures online showed that the bunks were in four bedrooms instead of in one big dormitory. As it turned out, no one else chose this alburgue, so we had the whole house to ourselves. Annalena came by at dusk to check our passports and wish us Buen Camino. Apr 28 – Woke up to a cold, windy morning with rain in the forecast. 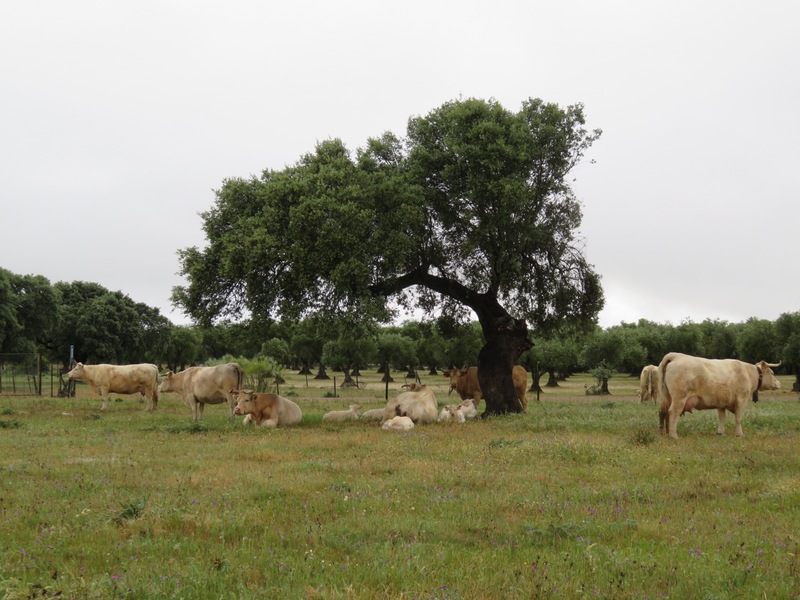 Even though the rain had not started when we left the alburgue, we opted to put on our raincoats because it was so cold. Within an hour, a cold rain started to fall. Not many pictures today. We were passed by a woman from Holland and a man named Christian from northern Germany. 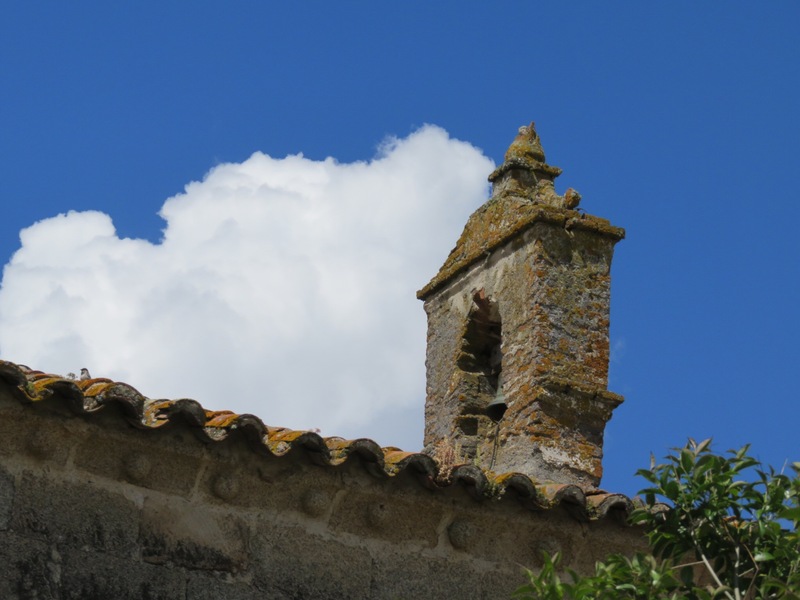 Although we only walked 11 miles today, I was beat by the time we got to Alcuéscar, from walking into the wind. We passed the alburgue and decided we deserved a night in a hostal. 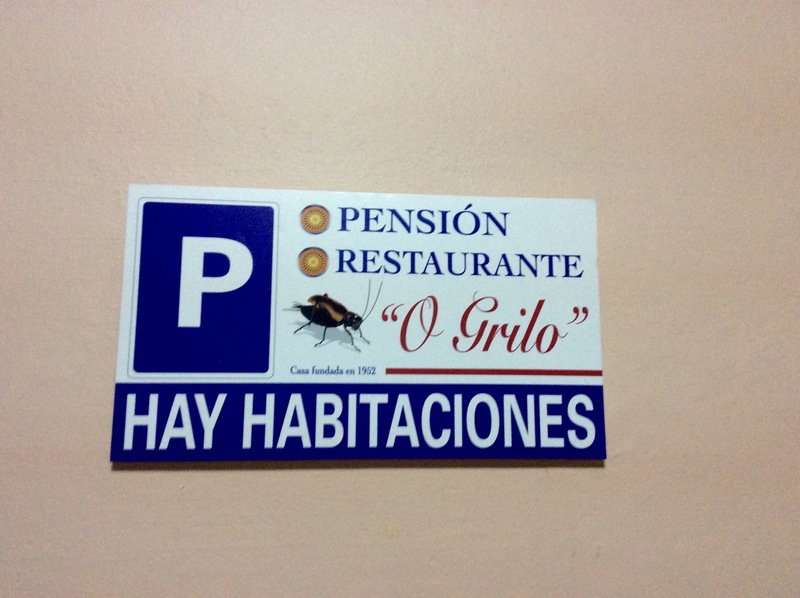 Unfortunately, the Hostal Olivo was overpriced, with very mediocre food, and no wifi. When it rains, it pours. 461 miles to go. 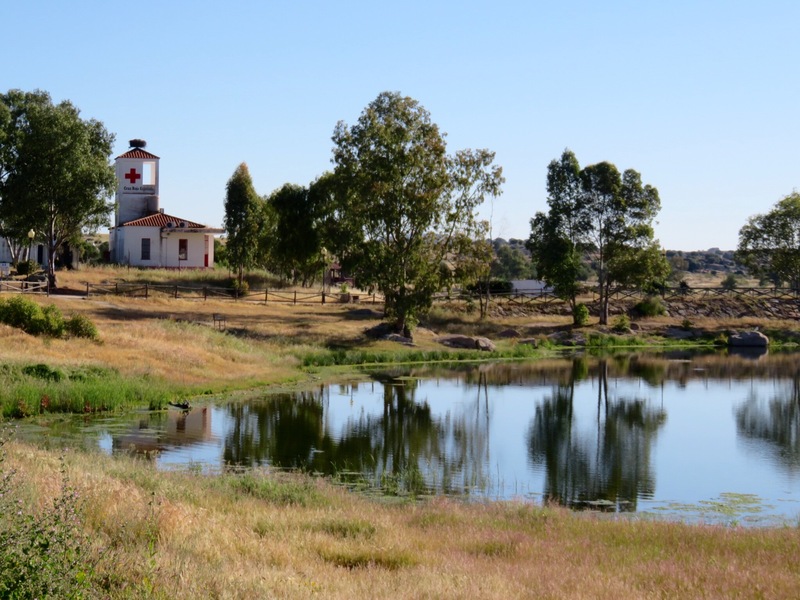 Apr 22 – Today our guidebook encouraged us to walk 18 miles to Torremejia. Although I am getting stronger, I’m not sure I am ready for quite that long a hike. 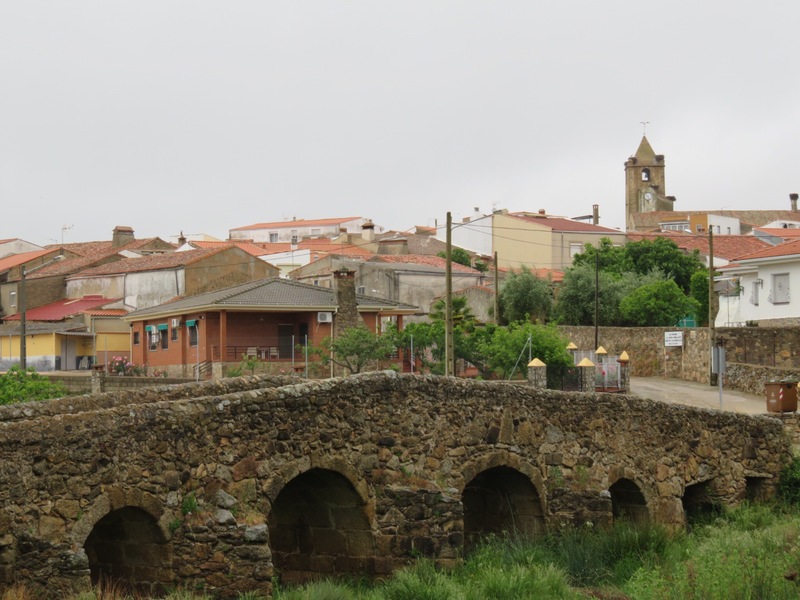 Luckily, my Camino app suggested that there was a town called Almendralejo with places to stay that was halfway between, but it was not part of the Camino. We decided to break the long march into two shorter days. 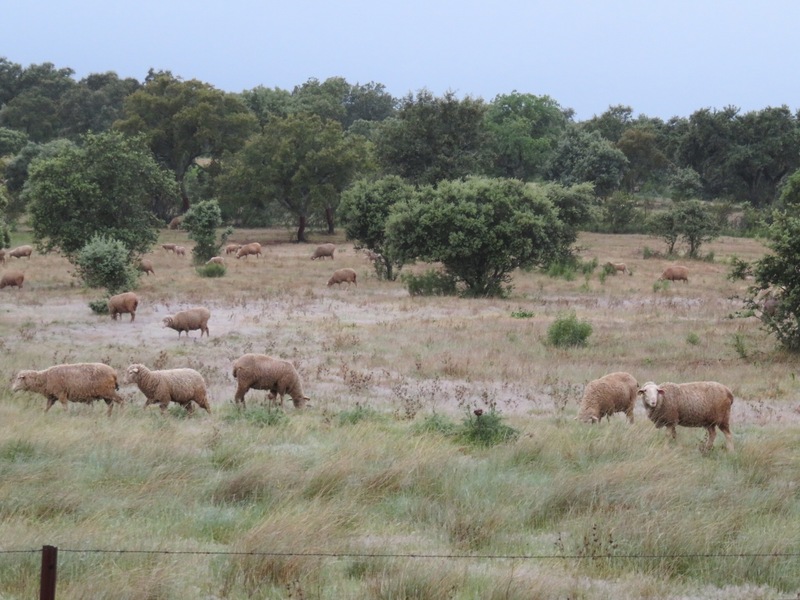 When we woke this morning, a new experience greeted us – rain! 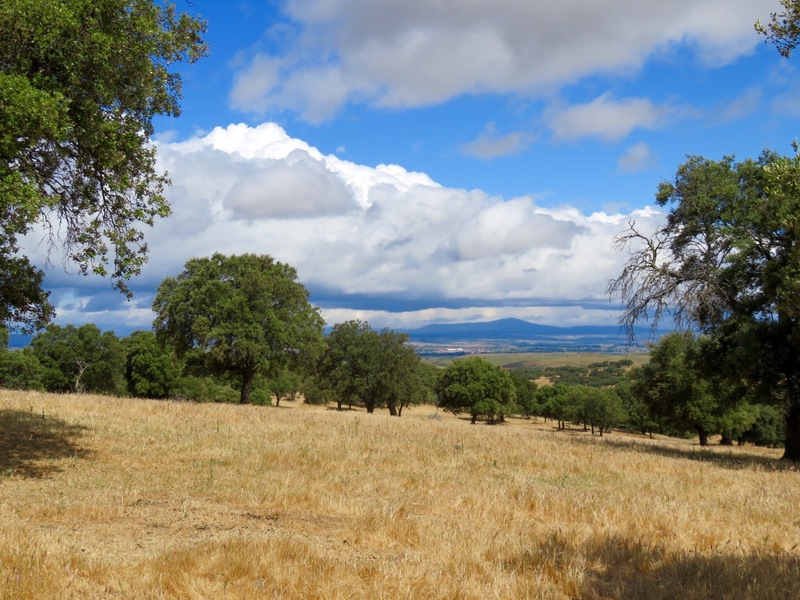 So far, our Camino has been sunny, dry and pleasant. Today we zipped on our raincoats, flipped on our pack covers, stowed our cameras, protected our phones in plastic sandwich bags, and set off in the gray drizzle. 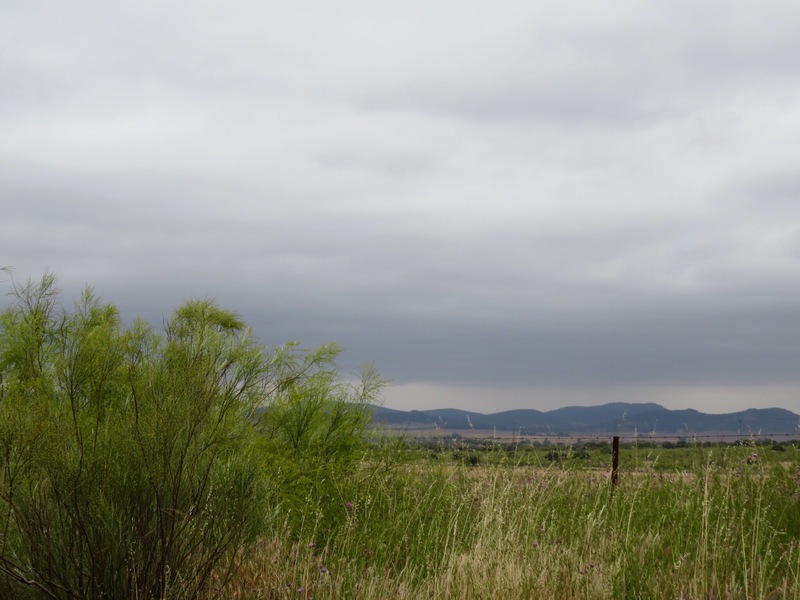 It was a soft spring rain – if you have to walk in the rain, this is the kind I recommend. 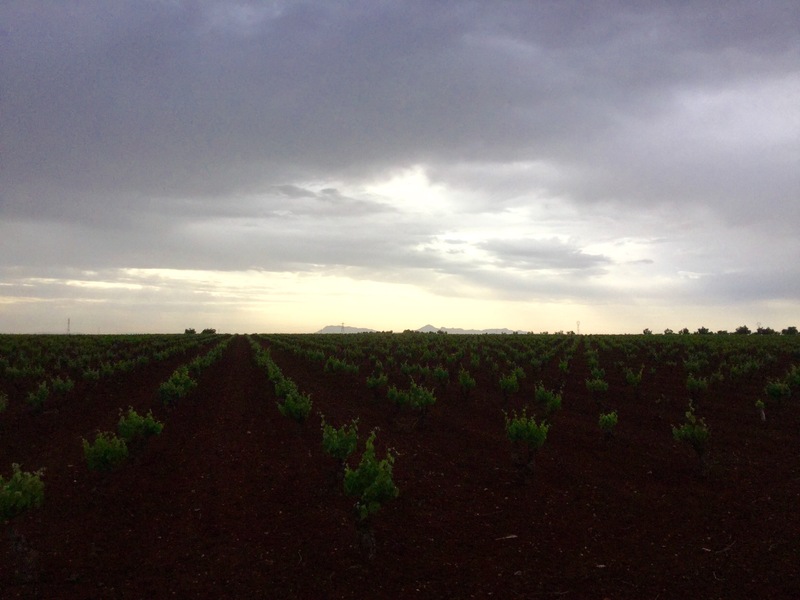 The sun never really came up, but there was a faint light in the east as we walked among the grape fields. 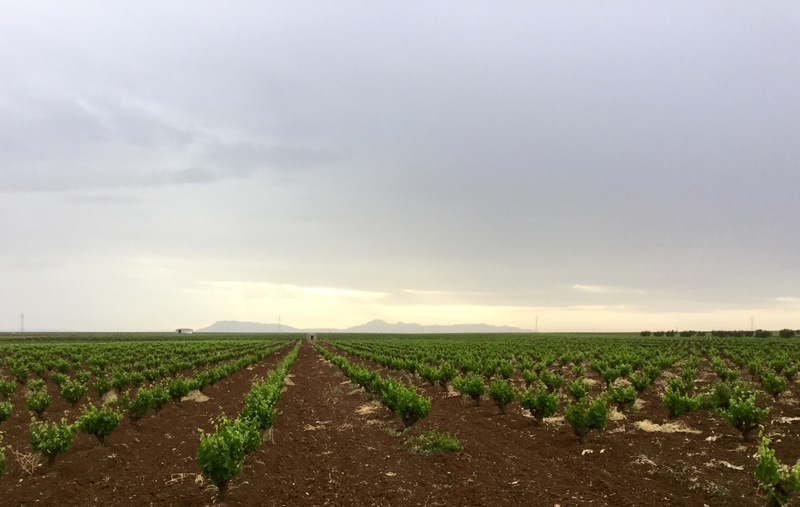 We met a young Italian couple wearing matching rain ponchos, and waved at the farmer tending the young vines. Nothing else to report- it was all rain, all grapes, all day. 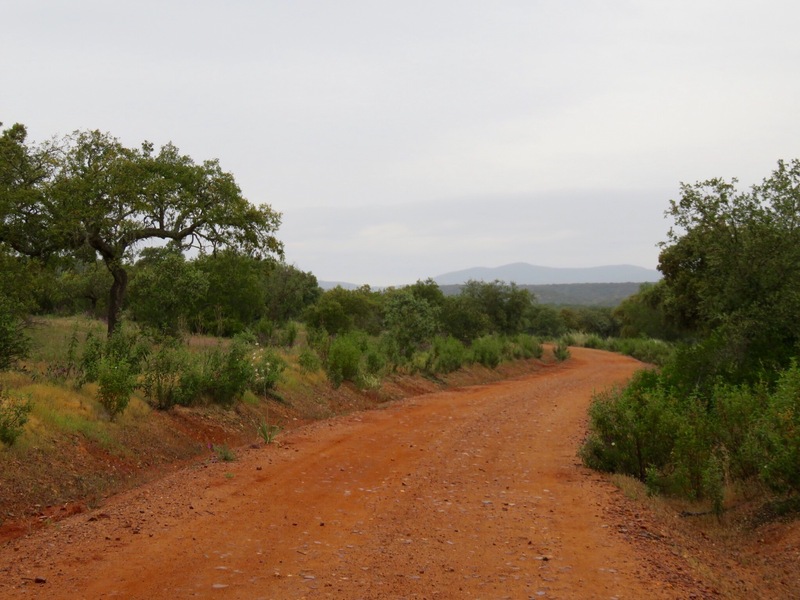 We turned on the GPS so we would know where to leave the trail – so long, comforting yellow arrows! 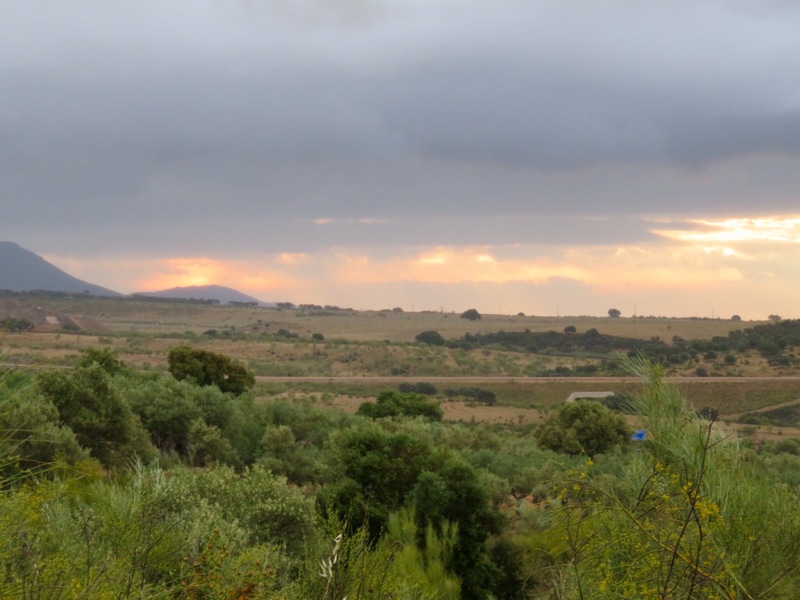 In a few miles, we reached the town of Almendralejo, walked over the highway overpass, and found our hotel. After a shower and a rest, we made our plan. As this is Saturday, we know the supermercado Dia will close early today and will not open at all tomorrow, so we need sufficient supplies to get us through until Monday. As this is not a Camino town, there are no signs for Peregrino Menu al Dia, so we’ll have to find a regular restaurant for our big afternoon meal. We did our shopping, then set out to find a restaurant. 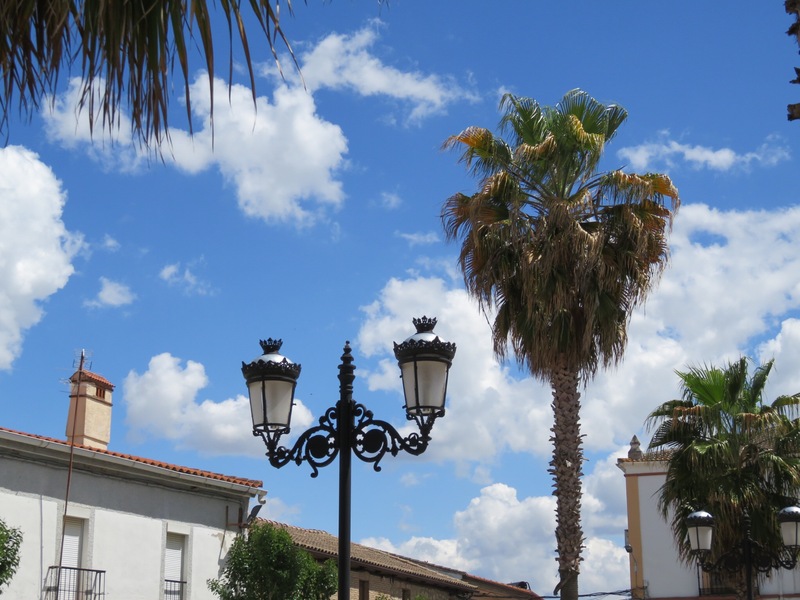 All the stores in Spain close around two, and that is when the restaurants open for lunch. We saw some possibilities on Googlemaps, but none near our hotel. We chose a few options, then set out to walk. Luckily, the rain had stopped and the sun was poking through – I dried my jacket by putting it back on! I couldn’t understand one thing on the menu, and Google Translate was not being helpful at all. Evidently the offerings were couched in superlatives that didn’t include words like ‘fish’ or ‘beef’. We asked for an English menu, perhaps? No bananas for you. 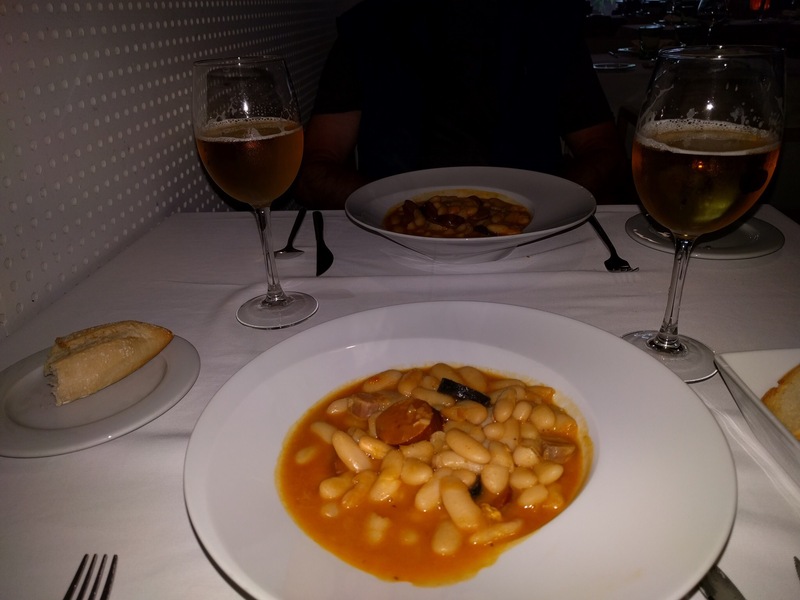 So Jim manned up and selected a random item on the menu – para dos. The waiter asked lots of questions, but we had to keep shaking our heads in the negative – even with Jim’s pretty decent Spanish, this guy was speaking some other language, and we just didn’t know what he was asking. Bread came, both crunchy and soft, with liver pâté and goat cheese – very nice! Beer came, in tall wine glasses. Little fried cheese empanadas came, courtesy of the chef ( we understood that). Green olives came, then more bread. A bowl of soup! Fava bean soup, to be sure, with chorizo sausage and hot peppers on the side, and very delicious, but still only a bowl of soup. And that was our big meal of the day, and there went $35. But as the story of the day? Priceless! 504 miles to go. With our breakfast, our host (sorry, he is Russian and I can’t spell his name) brought up some knee-high Wellington boots in different sizes, and offered them to us so we could venture outside. Oh boy! Just like when Lexi and I go out to splash in puddles! We got on our rain gear, and sloshed out to see Venice in the rain. Some shops were closed, but for others it was business as usual, in boots and six inches of water. The hawkers on the square were selling ponchos, plastic boots and umbrellas. Elevated walkways, like folding tables, were erected over some of the deepest spots, and in front of the Cathedral. By noon, the waters began to subside. Now, if you recall our quest, we are Looking for the tombs of the 12 Apostles of Jesus, to the extent that they are known. 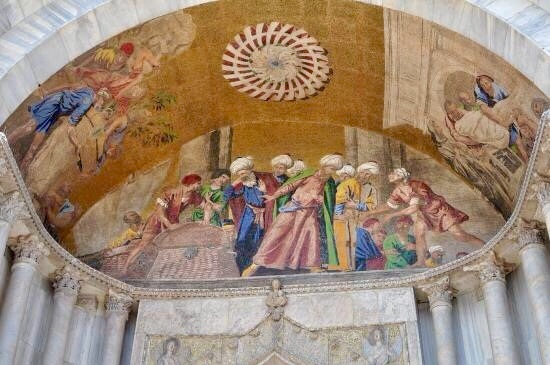 Here in Venice, we don’t have any of the Twelve, but we do have St. Mark the Evangelist, purported author of the Gospel to the Hebrews that bears his name, and one of the original 70 disciples whom Christ sent out to spread the Word. Close enough! 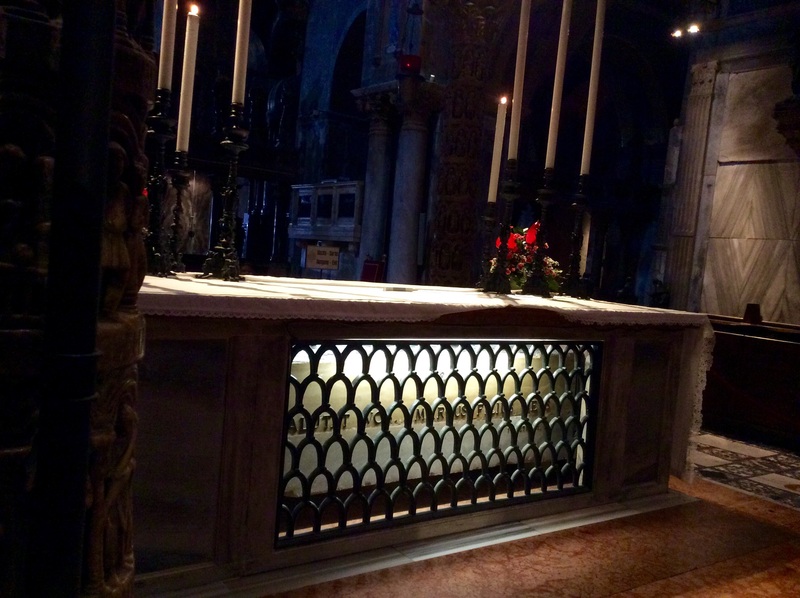 This cathedral is unlike others we have visited in that it is not lit in a modern fashion. The small windows, high up, don’t provide much illumination during the day. 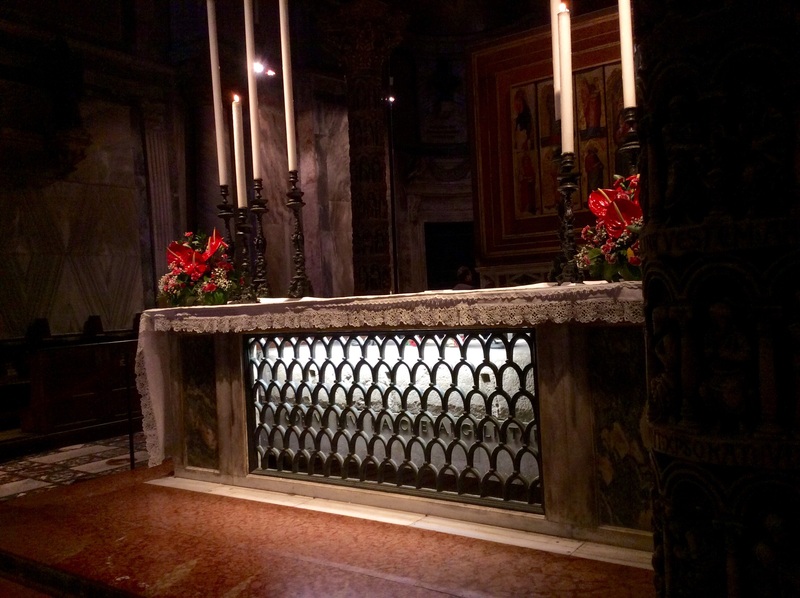 The candlelit interior must look very much as it did 1000 years ago. 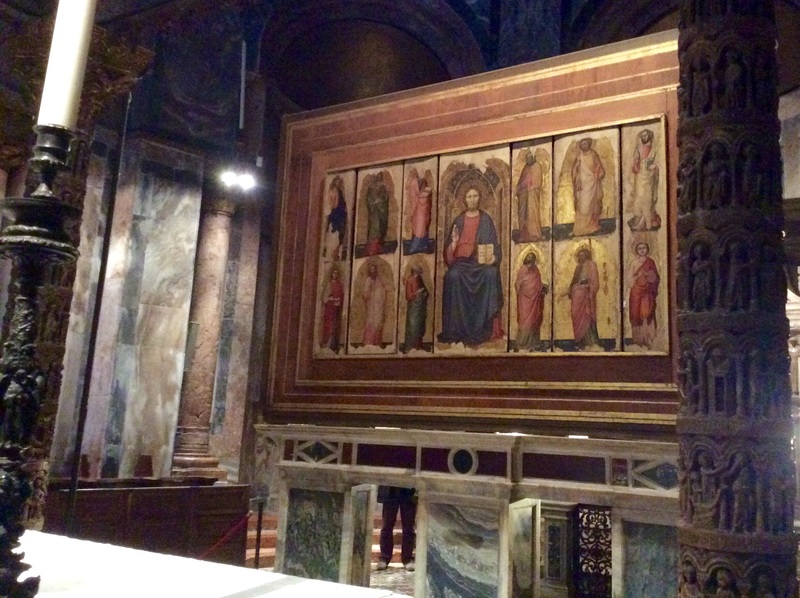 The low lighting helps explain why there was so much focus on filling cathedrals with gold – the reflective quality was needed to see! In the rear of the church is the high altar. We must pay 2 euro each to get close. 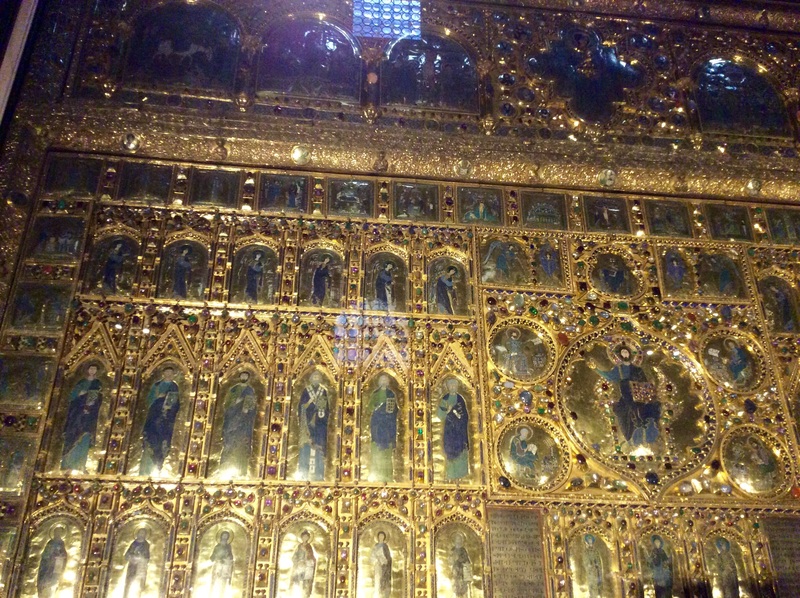 Behind the altar is a large gold panel, encrusted with gems. We moved on to a side chapel, to find a place to sit and meditate. Another good day. 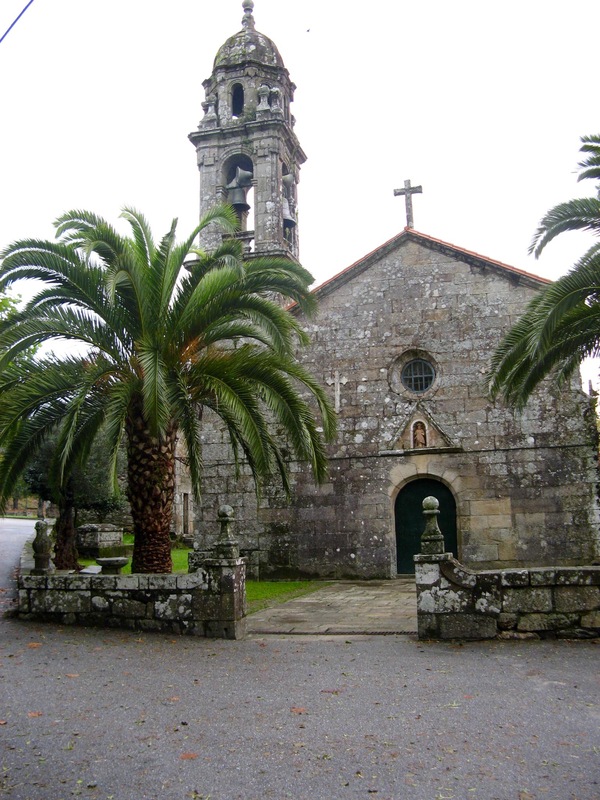 10/8 – we walked all the way through Pontevedra with the plan to stay at the only pension on our map that was north of the city, to give us a jump on the next day’s mileage. Yup, you guessed it, the place had gone out of business years ago. Our guidebook let us down again… We didn’t want to walk back to town, so we kept walking until we found an open bar. Jim stuck his head in and asked if there was any place we could rent a room for the night, and a lady jumped right up and motioned us to follow. 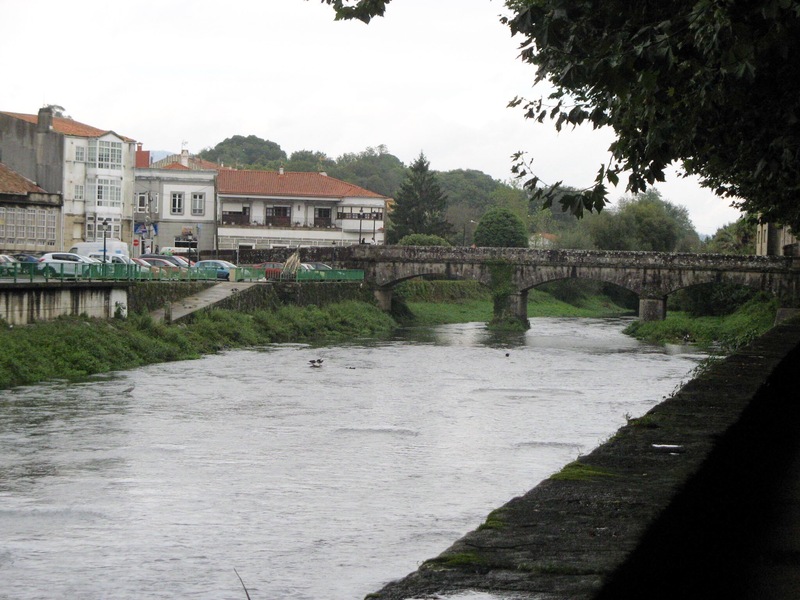 Sure enough, a new building with no sign, with rooms to rent, and right on the Camiño! 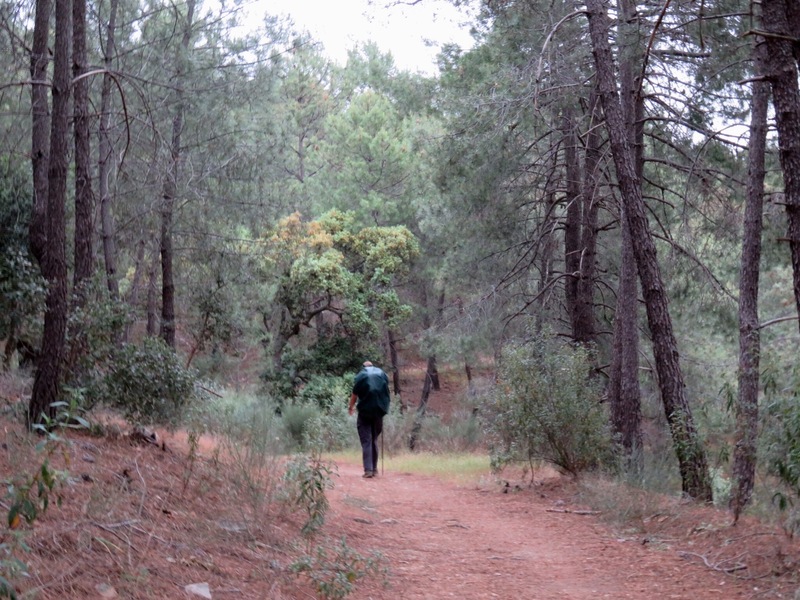 11 miles to Caldes de Rais, with rain, rain, then torrential rain. We got soaked through, and there was an inch of water in my backpack! Some people carry umbrellas rather than pack covers, but at the end of the day, we’re all just as wet. 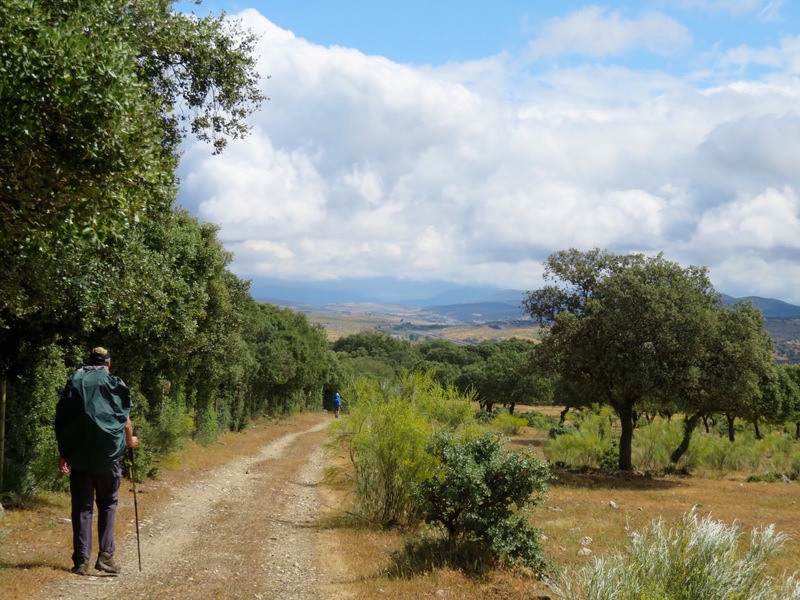 10/9 – 12 more miles to Padrón, our penultimate day before walking into Santiago tomorrow. Our nice pension man told us that the rain wouldn’t start until 11am, so we got as much mileage as we could in the morning. Sure enough, at 11 on the dot, the rain pelted down. 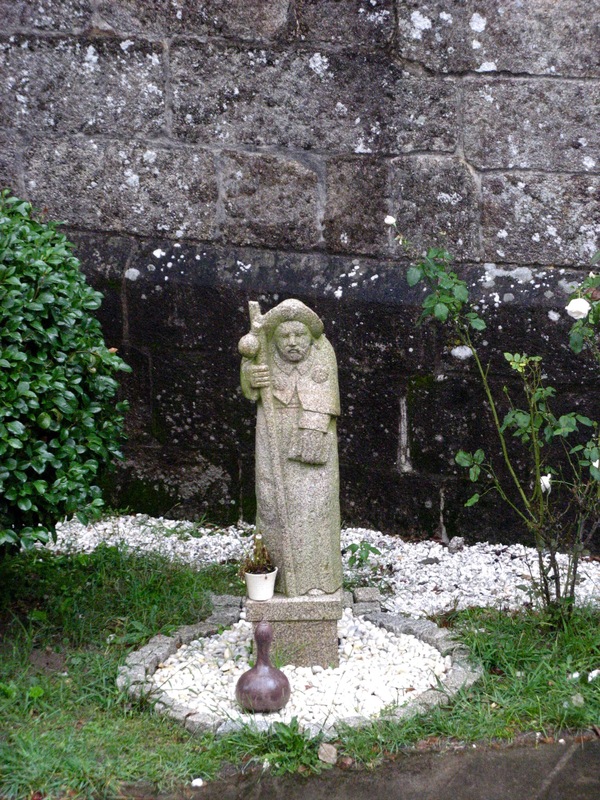 I was feeling cold and bedraggled when we passed by a little statue of Santiago. Even though I don’t like to take my camera out in the rain, I had to capture his expression. Standing all day in the rain, he looked as miserable as I felt! Should we tell them that there is a difference between a cricket and la cucaracha? 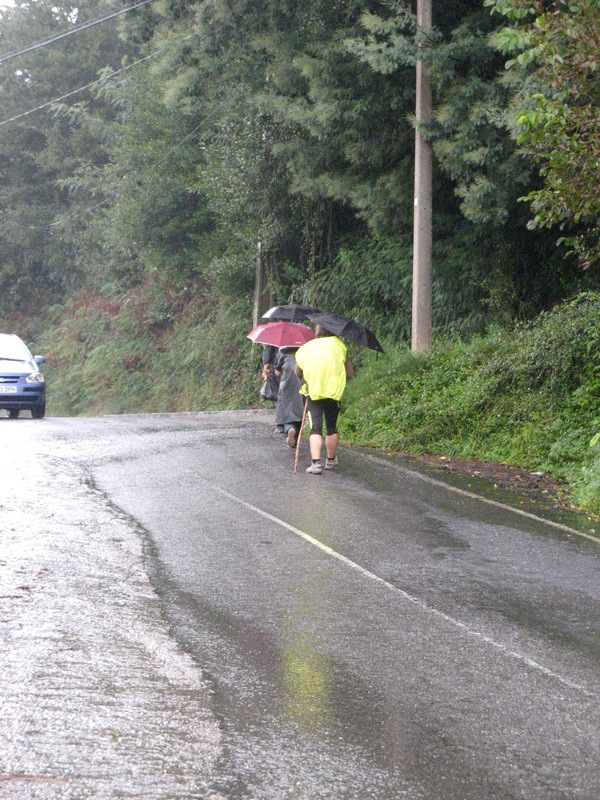 9/22 – 100% rain all day, with 12 miles to cover and hurting ankles. No pix today. Wet boots, wet socks, wet everything! Puddles that covered our boots, slippery cobblestones, drivers going 70 kph and splashing us. Other drivers slowing down to avoid splashing us, coming to a full stop so we can cross the street. A shopkeeper showing us his tally sheet of all the pilgrims who have come into his store, what countries they are from, and blessing our journey. His wife giving us home made candy, then making sure we each got a second piece. Meeting a fellow pilgrim from Denmark. 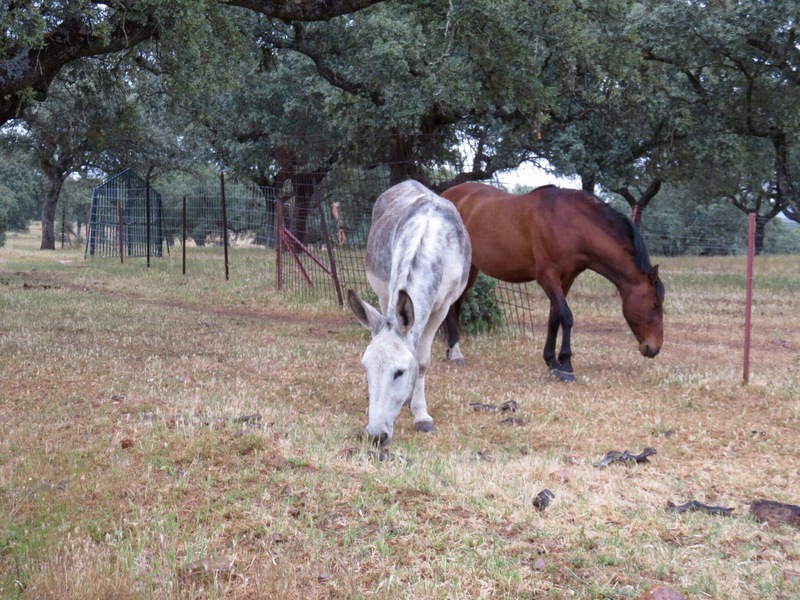 We arrived in a very bedraggled state at a new alburgue in Grijo, looking forward to a hot shower and a nap. Because it is new, we’ve seen no reviews, but are optimistic. The hostel has only one toilet, sink and one shower, lots of mosquitos, and no doors on the rooms. We have to sleep in bunk beds, and I have to take the top bunk. There is no soap or towels, so we shower and have to drip dry, and there are no sheets for the beds, so we just open our sleeping bags on the mattresses. The mosquitoes feast on us all night – I wish I still had my bug suit! We got very little sleep. A day of mixed emotions, but tomorrow we will arrive in Porto!